I’m sure that every brush calligrapher goes on a quest to find the best paper to use. You want a paper that takes ink well, without bleeding, and is smooth enough to avoid fraying your felt tip brush pens when lettering. But with the use of alot of ink or water you need to choose a paper that handles to be wet without warping. Bristol board paper is a great choice but more on the expensive side. It’s very smooth so your brush pens will feel like butter when writing on it. And it’s usually thicker so it lends itself very well if you want to make finished pieces for sale or gifts. Many different brands makes this type of paper. I’ve used Daler and Rowney’s, Winsor and Newton’s and Strathmore’s Bristol Board paper and I’m very happy with all of them! Since the paper type is the same I found very little differences between these brands. If you’ve tried to search for tips on which paper to use you most probably might have come across Rhodia paper. There’s so many who recommend it! And for good reason. It’s the best practice paper I’ve found too (after hearing about it from others of course I had to get it). The paper is smooth and thin. A little translucent which is nice for when you want slid a guide sheet underneath with lines, slant lines or practice letters to trace. They come as graph, lined, blank or dotpads. The Rhodia dotpads are very popular because the dots are used to guide you while you’re writing to keep straight lines. If you feel that lines distract from the work but it’s too hard to use blank paper, then the dotpad is what you need. When using a traditional brush for lettering or when applying a lot of water, the watercolor or ink can bleed through regular paper, a more suitable option in these cases would be to use watercolor paper. It’s good to tape down the paper to a board if you’re using a lot of water and allow to dry so the paper remains flat. These papers tend to be textured and can fray the felt tips of your pens if you use them directly*. I like to scribble my brush pens on a plastic surface (overhead or transparency film paper works great too!) and then use a brush with water to pick up the scribbled ink as watercolors. This allows you to do watercolor brush lettering (don’t worry, we’ll cover how to do that in future blog posts too, you’ll love it!). I have invested in liquid watercolors that I can dip my brush in too directly and write right away but preparing the colors you want from a palette pan works just as well, you don’t need the fancy stuff when you’re just starting out. *A little side note: if you have bristle tip brush pens as opposed to felt tip brush pen you don’t need to worry about fraying your tips on textured paper. This might just be my favorite paper to work with. Smooth as butter, so it’ll be you brush pens best friend. And it’s so convenient that it’s transparent because you can just place any paper (lined, grid, practice sheets) right underneath. I like to have lined paper underneath so my lettering stays straight. Another great thing about tracing paper is that it photographs amazingly. Place the paper on a white surface and take a picture that really makes your lettering pop! It gives it an almost floating effect which I love. Rhodia is best for practice. Bristol board is great for finished pieces if you like a little thicker yet ultra smooth paper. Watercolor paper can be used if you’re going to use a lot of wet ink or colors. Tracing paper, good for practice and photographing finished pieces, with a little simple editing you lettering will pop of the page. 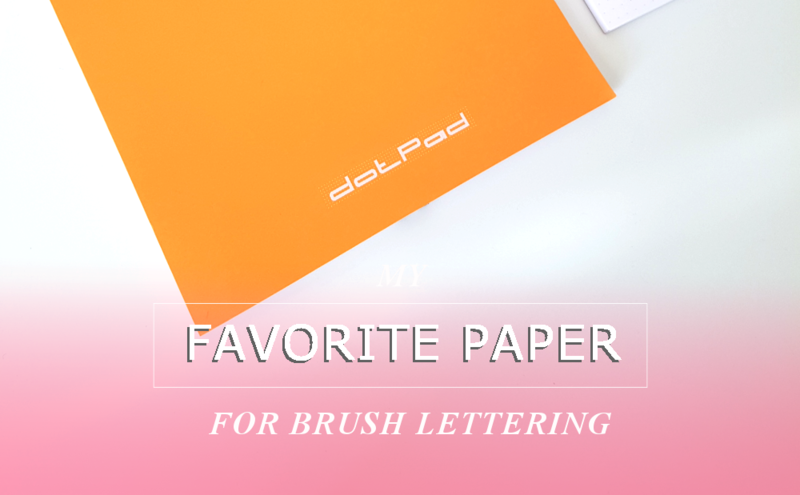 Whats your favorite paper for brush lettering? Have you found it or are you still looking? Write a comment below and let me know! And if you liked this post share it with your friends and don’t forget to subscribe below if you haven’t already to get the latest new and posts to your inbox. Talk to you soon!